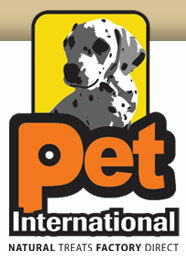 Pet International is a leading manufacturer of NATURAL DOG TREATS in South America. We take pride in providing our clients a direct source to Norh America and Europe with the highest quality of NATURAL PRODUCTS found in the industry. Pet International can ship via air and ocean which allows us to provide our clients with quick delivery and competitive prices. Pet International can create customized programs that will match your unique marketing needs. Through the power of private labeling and packaging we will assist you in creating products that are irresistible to your customers as well as their pets.